It can also capture 187MP images that are more than 16,000 pixels wide. On paper, the Panasonic Lumix S1R has pretty much everything needed to seize the top spot in the full-frame mirrorless camera market. It’s got the highest resolution (47.3 megapixels), the most powerful 4K video capture (50/60p), the best electronic viewfinder (5.76 million dots), the most effective image stabilisation (6EV), the most sensitive autofocus system (down to -6EV) and the fastest flash sync speed in its class (1/320sec). But it’s difficult for any camera maker to score a decisive blow in today’s camera market, and these are incremental advantages over rival cameras from Nikon and Sony rather than technological breakthroughs. In the long run, brand loyalty and user experience are likely to prove more decisive than the numbers alone. So what’s the Panasonic Lumix S1R got to tempt photographers away from brands like Canon, Nikon or Sony and nab the best mirrorless camera title? Well, you can find out how it handles in our Hands on: Panasonic Lumix S1R review but below is everything you need to know. 47.3 million pixels… or is that 187 million? The S1R's High Resolution mode that combines eight shots. The Lumix S1R doesn’t just have the highest resolution of any full frame mirrorless camera, it backs this up with a High Resolution mode that combines 8 shots with tiny sensor shifts between each. We’ve seen this before from Olympus, for example, but never with a sensor that has such a high native resolution. This technique typically requires a static subject, though the S1R does have an option to suppress motion blur. The outcome is a 16,736 x 11,168-pixel raw file of a size that would put the best medium-format cameras to shame – though there is a big difference between regular high-resolution image capture and this kind of computational photography. Regular images are captured with 47.3 megapixels, via a sensor with no low pass filter (for maximum definition), and special aspherical microlenses over each photosite to improve light-gathering efficiency. This, and a new Venus processing engine, have enabled Panasonic to push the maximum sensitivity up to ISO 25,600, only 1EV below the maximum sensitivity of the much lower resolution Panasonic Lumix S1. The S1R's Depth from Defocus system uses AI to improve performance. Interestingly, when rival makers have swapped to on-sensor phase detection autofocus systems, Panasonic is sticking with its contrast-based DFD (Depth from Defocus) system and using processing power to provide the speed. With the new Venus engine, it says the communication between the camera, the Lumix S lenses and the processors takes place at up to 480fps, for reaction times as low as 0.08sec. It also works in light levels as low as -6EV, which is 2-3Ev lower than most rivals. This DFD system is also highly sophisticated, using AI to improve performance and subject recognition. Panasonic says it can detect and identify humans, cats, dogs and birds and track them even with their back turned. Continuous autofocus on the S1R can be used at 6fps. It’s going to be interesting to see how Panasonic’s DFD system copes with fast-moving subjects, though this camera is not an action specialist in the same way as its rivals. It’s 9fps continuous shooting speed looks competitive enough, but this is with the focus locked on the first frame – if you want continuous autofocus the speed drops to 6fps. These are the same speeds as the 24-megapixel Panasonic Lumix S1. They’re respectable enough, but they’re beaten by the Nikon Z7 and Sony A7R III. The S1R does offer a 6K Photo mode that captures 18-megapixel images at 30fps, but most will feel that’s not quite the same thing. The S1R’s OLED EVF has a resolution of 5,760 million dots. The S1R’s OLED EVF has a resolution of 5,760 million dots. We remember when cameras didn’t have this many pixels! It’s not just super-sharp, but responsive too. Panasonic quotes a refresh rate of up to 120fps, almost non-existent lag with a response time of just 0.0005sec, and says it allows smooth and realistic motion tracking with fast-moving subjects. Round the back, the Lumix S1R sports a 3.2-inch touchscreen display with 2,100k dot resolution – just about the highest around right now – and a tri-angle tilt mechanism designed for both horizontal and vertical shooting. The S1R takes advantage of dual IS systems. The old arguments about lens-based versus in-body stabilisation could soon become redundant if more manufacturers like Panasonic switch to dual IS systems. The S1R combines an in-body 5-axis stabilisation system offering up to 5.5 stops compensation with a 2-axis optical stabiliser incorporated into Lumix S lenses. Between them, these give a combined stabilisation effect of up to 6 stops. When it comes to the body, Panasonic has put a lot of effort into this camera’s construction, using magnesium alloy die-cast front and rear panels, seals on all the joints, knobs and buttons and a durable 400,000-shot shutter. This also has a 1/320sec flash sync speed, the highest in its class, though with most high-end flash systems now offering effective high-speed sync modes, this may not be a decisive factor. In any event, the Panasonic Lumix S1R is built for tough, professional use (Panasonic has already launched its own pro support programme). It’s dust and moisture resistant and freeze-proof down to -10 degrees. It also has two memory card slots: one SD (UHS II compatible) and the other using the XQD format. This is physically identical to the emerging CFexpress standard and Panasonic says compatibility is on its way. Panasonic’s foray into the full-frame mirrorless market isn’t going to get far without a solid lens range to back it up. It announced its L-Mount alliance with Leica and Sigma last year, which means the S1R uses Leica’s 54mm wide L-Mount (almost as wide as Nikon’s 55mm Z mount). Panasonic has also announced three new lenses: the LUMIX S PRO 50mm F1.4, the LUMIX S PRO 70-200mm F4 O.I.S. and the LUMIX S 24-105mm F4 MACRO O.I.S. That’s a pretty fair spread to get the system started, though some might be surprised that the 70-200mm is a constant-aperture f/4 and not an f/2.8. 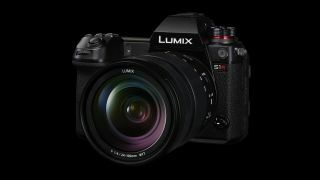 The Panasonic Lumix SR1 release date, UK wise, is 18 March. When it comes to the Panasonic Lumix SR1 price, you will be able to get the camera from £3,399.99 / $3,699 (body only) and £4,199.99 / $4,599 with the 24-105mm lens. DSLR vs mirrorless cameras – how do they compare today?